I was doing a bit of playing by ear the other night and I ended up listening to a great cover version of Cat Stevens’ The First Cut Is The Deepest which inspired me to do a really basic fingerpicking tab for any beginners out there. It’s a really great song and a bit of a deviation from my usual alternative rock stuff but it makes a great start point for newcomers to fingerpicking. A really simple set of chords, it’s just C G and F. Everyone knows those right? Watch out for the chord changes as they happen half way through the bars. This means you get half a bar of C, half a bar of G, half a bar of F and then half a bar of G again. It sounds a bit fussy so if you’re not nailed down yet with your basic chord changes I’d recommend practicing the 60 second chord changes technique. The good news is that the chord changes play right into our hands leaving us a simple 4 note picking pattern that we just repeat throughout the whole song. It’s basic but it’s pretty effective. Check this article out if you need help reading tab. Play it slowly to begin with, however slowly you need it to be to keep it fluid. Once you get comfortable making chord changes whilst fingerpicking you can slowly increase the tempo, although it’s not the fastest song in the world anyway. It’s a big help when playing anything fingerstyle to work out which fingers you should use on which strings. If you get this down early on it will stop you getting into difficult positions mid-song. I’d highly recommend using your thumb for the C string, your index finger for the E string and your middle finger for the A string on this one. That should allow you to take it nice and steady. There’s more information on fingerpicking for beginners here. It can be quite difficult to have the stability with your picking hand to fluidly pick anything. If your hand is moving around, in and out of position then it’s going to be pretty tough. A lot of players (myself included) rest part of their hand somewhere on the ukulele to give that extra stability. On this song, with this picking pattern we’re not using our pinkie so we can simply rest it on the body of the ukulele, just below the strings where it feels nice and comfortable. If you’re not already doing this you should find that it will help your fingerpicking by quite a lot. That’s about it, not too challenging but it works really well. Pretty sweet! Three of the chords i first learned. I’ll take this song on. I’m not understanding. Where are the chords on the sheet music? Can you play this so I know how it should sound. That would help a lot. Thank you. I don’t understand how to read this tab (or any tab I guess). Do you have a post explaining how to do this for complete newbies? 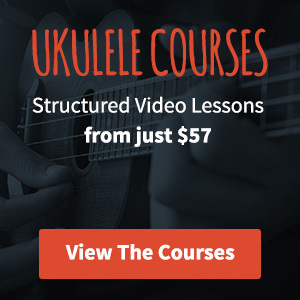 Hey Carrie, I do – head this way to find out how to read ukulele tab. As a 62 year old that has only JUST taken up the ukulele, I found this post to be mostly easy to follow. It did take me a while to figure out the “The First Cut Is The Deepest” tab but once I did, it made sense. Like Carrie, I really don’t quite have a full handle on tabs in general, but I am determined. I have tried the guitar…too many strings, I like my glockenspiel, but it’s not very portable, so I am GOING to make a GO of the ukulele. Thanks, Dave. What song is this a cover of? Hi Neil, well a lot of people have covered this song but the one I am referring to was just a YouTube user covering the original. Hope that helps! Thank you so much! Fingerpicking has always confused me, but now I understand it! I am a bit confused about the chords. Do you hold the chords while playing or do you hold the string with the number on it. I read your page about how to read ukulele but I am still needing a little bit more explaining. Otherwise this really did help! The tab (strings with numbers on them) is pretty much exactly just the chords fretted – either or will work here! I think what I’m missing here is the equivalence between the finger-picked single string and the chord sequence. If we do not have the chords matched to the fretted strings and the half-bar changes it is not immediately apparent -at least for me! – how the two are linked. But, not to worry, I should be able to find the chord version elsewhere. For over a year I’ve been playing at the soprano and concert ukes. I’m slowly making more and more time for playing. Tabs have never stuck with me. I think with this explanation I may have it, but I will need more time. My mind just won’t let me grab on. Crazy isn’t it? As I am practicing, I was wondering if I should Practice with 4 fingers and 4 strings, what say ye? I’d go with the thumb, index and second finger for this one. This is so helpful!! My practicing has been all over the place. Thank you for helping me get focused on a strategy and reasonable goal!